This concept is very well known to good gamblers who understand that they’re playing a negative sum game against the house. But in knowing when to bet big they can increase the odds that they will beat the house. That is, they can increase the expected value of their overall outcomes by knowing when to place the right bets. This isn’t only due to the fact that they make big bets when the odds favor them, but also because they don’t make the catastrophic mistakes that result from betting on things you can’t understand. They not only win big, but they avoid losing big. While investing is not necessarily synonymous with gambling this idea is crucial to understanding how to implement a successful investment approach. Whether it’s buy and hold investing and understanding that stocks tend to rise over long periods of time or understanding the value of specific firms relative to other firms. Smart investors think in terms of probabilities and not certainties. Saying that stocks will tend to rise over the long-term is not nearly as useful as some might think because our financial lives are a series of short-terms inside of a long-term. In other words, our investment time horizons tend to be multi-temporal. This forces us to think in some version of the “short-term”. And this is where predicting the future gets difficult. After all, over short periods of time the fluctuations of the market become increasingly random. 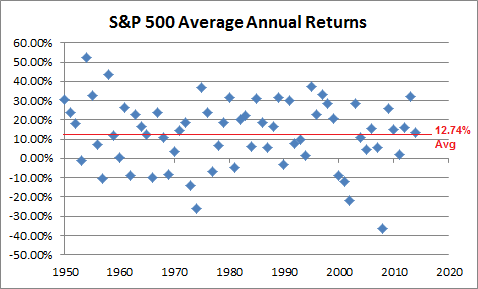 For instance, if we look at the daily, monthly and annual returns of the S&P 500 over the last 60 years we can see just how much time impacts our portfolio outcomes. Increasing your time horizon reduces the randomness of the stock market’s negative performance because what you’re really doing is improving the odds that your portfolio’s performance will correlate with broader corporate output. So, it’s not really about not being able to predict the future. It’s about understanding how the world works and then applying high probability outcomes to future events. This is not about “knowing nothing” or avoiding predictions. It is very much the opposite. I would argue that the more you know the greater the probability that you will make high probability predictions about the future. Of course, smart investors also know their own limitations. They know the limits of concepts like “the long-term”. They know the limitations of ideas like “the short-term”. They know the arithmetic of the market and the importance of reducing taxes and fees. They understand the futility of trying to “beat the market”. And they know that the stock market isn’t where you get rich. As GI Joe taught me many moons ago, knowing is half the battle. The other half is applying your knowledge in a manner that is likely to result in a high probability of you meeting your financial goals. The Myth of Passive Investing Begins to Unravel….